One of the best info-apps to come about in recent years is the well-known and super-practical Can I Use by Alexis Deveria. Although a single resource doesn’t really exist (at least none that I know of), there are a few resources I’ve come across that, together, form a pretty good overview of which features are supported in which browsers, and in particular any older versions of IE that you might still have to support. Before getting into the resources, I think it goes without saying that doing actual testing on the different devices and browsers that you have to support should always be the primary method for determining support. It’s nice to be able to get a second-hand overview of support. 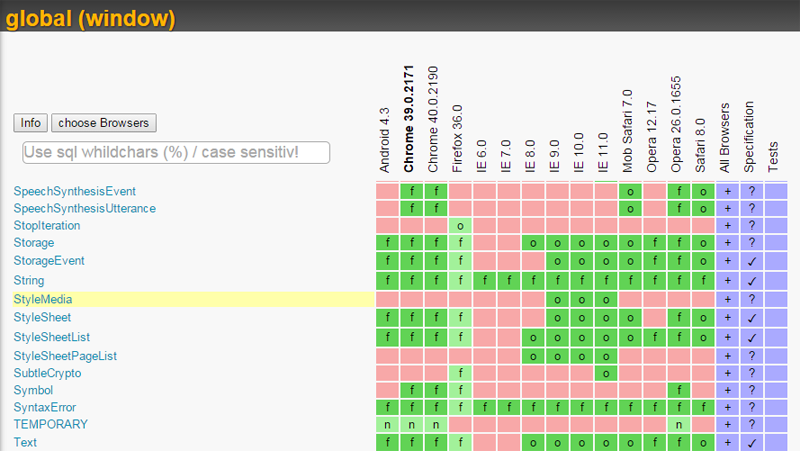 But “support” tables don’t always include any relevant bugs that might make the feature in question unusable. And that’s besides the fact that some resources can be just plain wrong. So make sure to do testing and use the references described in this article as guides, not as the final word on whether something works in a particular browser on a particular platform on a particular device. 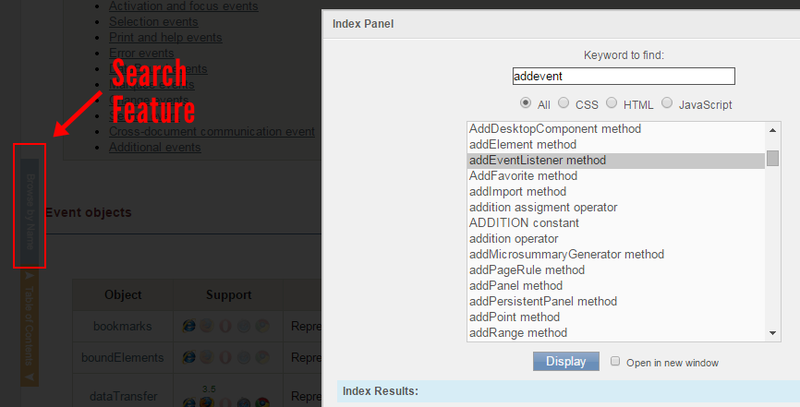 For example, let’s say you want to look up addEventListener() and removeEventListener(). You won’t find those on Can I Use. But you can find both, with browser info, on MDN. As you can see in the screen grab above, in addition to the details showing which browsers have “Basic support”, there’s often additional info in that chart on features that might have been added in later versions of ECMAScript. Remember also that MDN’s reference is editable by anyone, so if you discover that something is incorrect, feel free to update it. What discussion on browser compatibility tables wouldn’t be complete without mentioning Peter-Paul Koch and his excellent reference tables, which are all based on his own tests. Koch’s tables include support info for desktop and mobile browsers, and it looks to me like the DOM stuff is pretty up to date, indicating support for IE11 and iOS7. This one is definitely not very well known, but it might have something that’s not included in Cody Lindley’s tables or something that isn’t well-documented on MDN. It’s Big JS-Compatibility-Table, created by Tobias Buschor. Although this is a really comprehensive resource, I have noticed it can sometimes be slow, and the primary site seems to have some error occurring, so I’m not sure if Tobias has been maintaining the resource, as good as it is. I generally use this one as a third or fourth possibility if I’m looking at a particular feature that’s not too well documented elsewhere. In addition to browser support, this one also gives a brief description of the feature you’re looking up, so that’s a bit of a bonus. You can also search right on the main page, but I like the search in the lightbox because it instantly filters the results based on what you type, rather than having to see a results page first. Overall, the Dottoro reference is a nice, attractive resource that also includes browser support info for HTML and CSS features. Usually when we’re wondering about browser support, it’s because we want information on older versions of IE (now including IE9 and IE10, both of which are considered “old” by today’s standards). So if you drill down to the page on the forEach method for the Map object, you’ll get a description of that feature along with a section called “Requirements”, which outlines which versions of IE support that feature. That’s just a small sampling of what’s available to look up. There’s also the DOM reference, the Web Applications reference (which covers many of the HTML5 APIs), and the Graphics and Media reference, which covers Canvas, the Audio/Video APIs, SVG, and WebGL. The only real flaw in these IE Dev Center reference pages is the fact that they only cover support for IE browsers. But that’s not a big deal since IE is usually the main reason we’re looking up info on browser support. If you’re looking for ECMAScript features that have been added since ES5, one of the best resources is the Compatibility Tables by Juriy “kangax” Zaytsev and Leon Arnott. 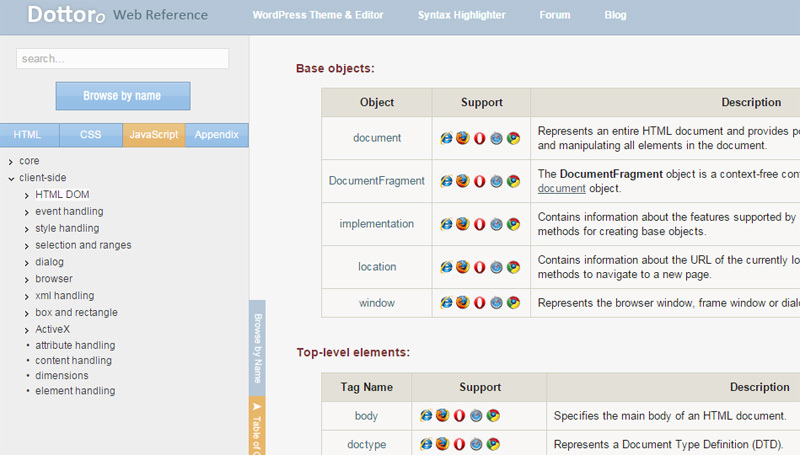 The reference includes tables covering compatibility info for ES5, ES6, ES7, and non-standard features. The tool uses info from the Kangax tables and Can I Use, so the focus here seems to be on the newer APIs and stuff added in ES5 and later. Here you get a breakdown of the features used in the code that had compatibility issues (that is, they have less than 100% support), and which browsers cause the problems. I will warn you that this tool is new and could probably use some improvements. For example, when I paste in some code that uses the dataset property, JSCC tells me the code doesn’t have any compatibility issues. But MDN says it’s not supported in IE10 or lower. This happens even though dataset is listed on Can I Use, so the results should be accurate. So while this is not a complete and fool-proof tool, it’s certainly something to keep an eye on as it improves. Of course, there may have been something I’ve missed. So if you know of another source, feel free to add it to the comments. Louis has been involved in the web dev industry since 2000, and is a co-editor of the HTML/CSS content on SitePoint. He blogs at Impressive Webs and curates Web Tools Weekly, a newsletter for front-end developers primarily focused on tools.